There are 9 Assisted Living Facilities in the Panama City area, with 8 in Panama City and 1 nearby. The average cost of assisted living in Panama City is $3,000 per month. This is lower than the national median of $3,346. To help you with your search, browse the 42 reviews below for assisted living facilities in Panama City. On average, consumers rate assisted living in Panama City 4.3 out of 5 stars. Better rated regions include Panama City Beach with an average rating of 4.5 out of 5 stars. Caring.com has helped thousands of families find high-quality senior care. To speak with one of our Family Advisors about assisted living options and costs in Panama City, call (855) 863-8283. Panama City is located in Bay County, Florida. Seniors have a choice of relaxing on white sand beaches overlooking the Gulf of Mexico or St. Andrew's Bay, which is nearby. They may also enjoy guided dolphin watching and restaurants with waterfront views and live music. Assisted living facilities in Panama City are regulated by the Florida Agency for Health Care Administration (AHCA). In Florida. AFLs must offer residents assistance or supervision for daily tasks for at least six days a week and no less than 12 hours a day. There are eight facilities located within Panama City and one nearby in Lynn Haven. The Panama City area is home to world-class medical facilities, including the Gulf Coast Regional Medical Center, in the event of medical emergencies of illness. Panama City has an array of community resources for seniors, including the Bay County Council on Aging, which provides Meals on Wheels, fellowship centers and a caregiver support program, as well as four senior centers. The average summer high is Panama City is around 90 degrees, and the temperature in the winter rarely drops below 40, which makes this an excellent area to retire. The area typically receives no snow in the winter but does get an above-average amount of rain throughout the year. The cost of living in Panama City is lower than other comparable cities in the United States and within the state of Florida. This is ideal for seniors on a budget or those with limited means. According to the American Lung Association, the air quality in Panama City and the Bay area is better than many other cities in the state and region. This is important for seniors with respiratory illnesses looking for a place to live. The Bay County Transportation Disadvantaged Service Plan (FDOT) provides transportation services to the elderly who do not drive or those without adequate access to other transportation services. Also referred to as Find a Ride, this service provides rides to medical appointments, shopping trips or sightseeing. Assisted Living costs in Panama City start around $3,000 per month on average, while the nationwide average cost of assisted living is $4,000 per month, according to the latest figures from Genworth’s Cost of Care Survey. It’s important to note that assisted living rates in Panama City and the surrounding suburbs can vary widely based on factors such as location, the level of care needed, apartment size and the types of amenities offered at each community. 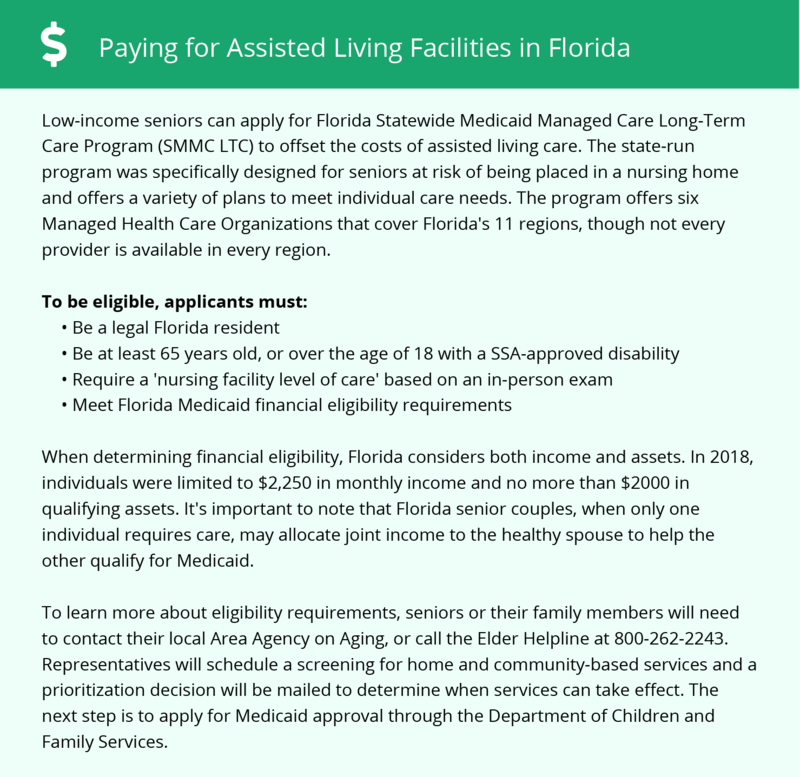 Seniors who require financial assistance for AFLs within Florida and Panama City may be eligible for assistance through the Statewide Managed Medicaid Care Long-Term Care program. The Option State Supplement (OSS) is also available. Both of these financial assistance programs as designed for low-income individuals living in residential care facilities. Panama City and the surrounding area are home to numerous government agencies and non-profit organizations offering help for seniors searching for or currently residing in an assisted living community. These organizations can also provide assistance in a number of other eldercare services such as geriatric care management, elder law advice, estate planning, finding home care and health and wellness programs. To see a list of free assisted living resources in Panama City, please visit our Assisted Living in Florida page. Panama City-area assisted living communities must adhere to the comprehensive set of state laws and regulations that all assisted living communities in Florida are required to follow. Visit our Assisted Living in Florida page for more information about these laws.